Bartzella is a truly unique peony. 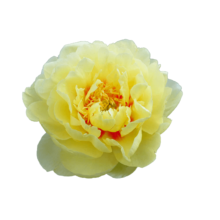 They are a real challenge to keep, but if you can you'll be rewarded with a beautiful canary-yellow flower! Bartzella belongs to the so-called Itoh peonies: a crossing between tree peonies and herbaceous peonies. Growers have been trying since the beginning of the 20th century to cross tree peonies with herbaceous peonies. And for years and years, it just didn’t work out. It wasn’t until 1948 that a Japanese horticulturist, Dr. Toichi Itoh, created the fist succesful hybrid peonies. Roger Anderson later developed the variety Bartzella in 1972.